Cable TV news draws a much smaller share of viewers (38%) than local TV news (71%) or network TV news (65%). But when it comes to time spent watching, cable TV beats the traditional broadcast outlets by a large margin among those who describe themselves as heavy television viewers, according to a Pew Research Center analysis of Nielsen data. The most dedicated cable news viewers average 72 minutes, more than an hour, of home viewing a day. By contrast, heavy viewers of network TV news watch almost 32 minutes a day and heavy viewers of local TV news watch nearly 22 minutes a day. Viewing time drops off dramatically for the bottom two-thirds of cable news viewers (those who are “medium” and “light” users). Those in the middle tier average slightly more than three minutes of viewing time and those at the bottom catch a glimpse for less than a minute. In those categories of viewers, network TV news and local TV news fare somewhat better. Even the heavy viewers of local and network news spend more time watching cable news than they do watching network and local news. The most devoted local news viewers spend an average of about 22 minutes a day on local news compared with about 32 on cable. (They also spend almost 24 minutes a day watching network news.) 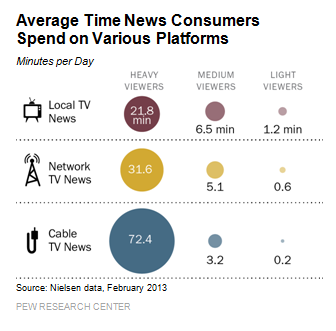 The heaviest network news users spend about a half minute more (32 minutes) watching cable than network.